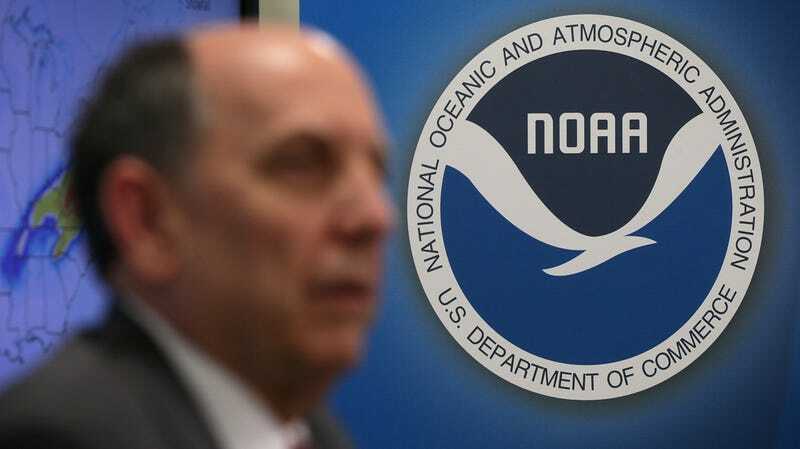 National Weather Service Director Louis Uccellini speaks at a news conference at the NOAA Center for Weather and Climate Prediction in January 2016. Employees at a National Weather Service center in Maryland were randomly interrupted by a “message in Chinese” broadcast over the facility’s little-used intercom system on Wednesday, morningthe Washington Post reported. Bizarrely, it also reached “employees by phone” in the same complex. There’s no indication that this was necessarily anything nefarious, like foreign hackers. Since people are generally not alerted by phone to pick up Amazon packages at embassies, it instead seems like it is probably tied to a wave of phone scams targeting Chinese expats or immigrants in the U.S. and abroad. In April, the Chinese embassy issued a warning about the scams, which generally pose as government officials advising recipients to retrieve packages from embassies or threatening them with criminal prosecution before demanding they divulge sensitive financial information like banking or credit card credentials. The Federal Trade Commission also issued its own warnings that month, with the New York Police Department warning the scam had resulted in roughly $2.5 million in known losses to victims in NYC from December 2017 to April 2018. In other words, Occam’s Razor is that somehow the call was spam somehow routed over a building-wide comms system. The Post noted that two employees said they could only recall the intercom being used for shelter-in-place or fire drills, so perhaps someone with little familiarity with the system accidentally redirected the call to an administrative phone line, or there’s a long-forgotten crossed wire which allows anyone to dial it directly. Regardless of who you are or who says they’re calling, never send money to anyone who calls and asks you to send it. Never give your Social Security number, your bank or credit card number, or other sensitive information to anyone who calls and asks for it. Same thing if they email or message you through a social media platform such as WeChat: just don’t respond. That’s a scam. And neither the real Chinese Consulates, nor the Chinese Embassy, will ever call you to ask for money. But who knows? Maybe the National Weather Service really does need to pick up a package. Or a dead drop for the deep state Illuminati agents secretly controlling the weather.